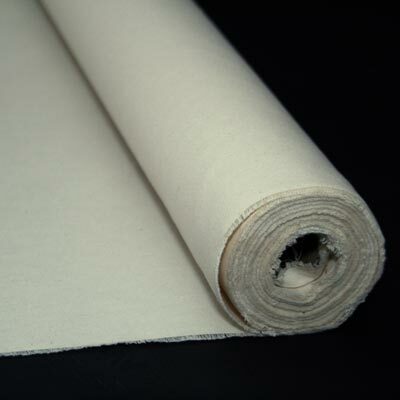 We offer unprimed canvas from 7oz – #10 (14.75oz) rolls, from 36″-144″ widths, available in 5-50 yard rolls. 7oz -9oz rolls are on page 1. 10oz is listed on page 2. #12 (11.45oz) is listed on page 3, #10 (14.75oz) is listed on page 4. FREE SHIPPING ON ORDERS OVER $99.00. 12.5 oz/sq.yd. – heavy weight unprimed canvas 70″ wide. Made in the U.S.A. Smooth texture and tight weave. “A” grade ounce duck. 12.5 oz/sq.yd. - heavy weight unprimed canvas 70" wide. Made in the U.S.A. Smooth texture and tight weave. "A" grade ounce duck. TO ORDER, ENTER THE DESIRED QUANTITY OF ROLLS AND ADD TO CART. 9.25oz./sq.yd. - medium weight unprimed canvas 70" width. Made in the U.S.A. "A" grade ounce duck. Tight weave and smooth texture. A FREE sample pack of our unprimed cotton rolls, so you can see and feel the different types of canvas. 1 per customer, NO Shipping charge.